Screenshots in HD, thanks to an isometric camera. Mineshot 1.8 is a mod that actually is based on a function that a Notch day scheduled to take screenshots in Minecraft, was available only in 1.2 and 1.4 Beta versions of Minecraft. This mod is an enhancement of the function, which lets you create screenshots in high resolution and isometric high-resolution images without using external programs. So, this mod allows us to take high resolution images of our buildings, landscapes or what we want. In addition the nature of this feature allows us to move the camera to focus on the screen from anywhere we want. 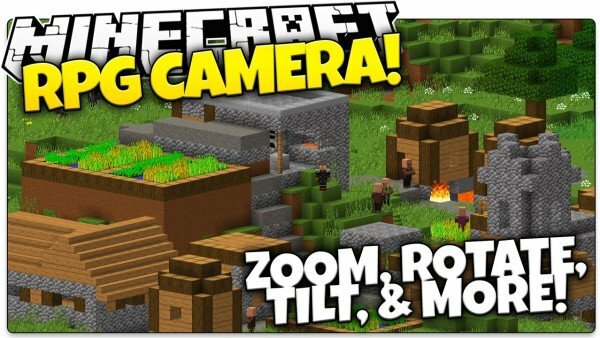 To set the camera movement keys and other functions, you must enter into Minecraft game menu and enter the “Controls” section. The images are saved as usual in .minecraft / screenshots folder. How to install Mineshot Mod for Minecraft 1.8? Take photos in high resolution of your worlds or constructions!